The cat wandered into the Indian village looking for food. FREAK OUT WHEN you see a stray rat? Spare a thought for those in Chandrapur, Maharashtra, India. They have to deal with wild, intruding leopards. A leopard caused panic when it jumped from the roof of a house during an attempted rescue operation, going straight after officials trying to capture the rogue animal. Onlookers scattered but one man, Bandu Dhote, was bitten on the waist. The city is surrounded by jungles that are part of the Tadoba-Andhari Tiger Reserve, and it’s thought that the leopard wandered into the city enclosure to prey on the cows, calves and Buffalos. According to India Today, wildlife activist Dhote was heading-up the rescue having freed 50 wild animals so far. It involved covering the shack with a net before removing tiles to shoot a tranquilliser. But, as this shocking video footage shows, things didn’t exactly go to plan. The leopard jumped from the floor, 14ft down, and immediately targeted Dhote. The leopard hid out in a water-tank in a nearby bathroom before it was captured after a four hour stand-off with the Forestry Department. No one was seriously injured. It’s not the first stray leopard to terrorise India’s small towns, with one straying inside a hospital and cinema back in February. Experts blame illegal deforestation and logging that destroys the nearby wildlife’s habitat, causing them to wander for some easy prey. Email “Wild leopard shocks rescue workers by leaping up through roof”. 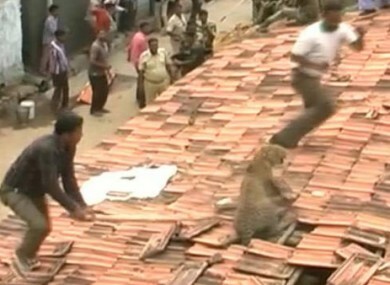 Feedback on “Wild leopard shocks rescue workers by leaping up through roof”.